Seneca County Family & Children First Council will hold a Bridges Out of Poverty training session at the Department of Job and Family Services (900 County Road 20, Tiffin) Friday, Sept. 21, 2018, 9 a.m.-12p.m. The goal of the program is to review the skills, policies and procedures that will enable organizations, employers and communities to become more skilled in working with individuals who are in poverty. Explore how to use Bridges constructs with clients. Before training – What are some things I do not understand about individuals living and poverty and the choices they make? During training – How can I support individuals seeking to move out of poverty? After training – What are program design changes I think need to be made based on what I have learned today? Individuals living in generational poverty are excellent problem solvers. How can we engage people from all classes? Fremont, OH, February 21, 2018 – Terra State Community College’s Kern Center has announced a new partnership with Development Dimensions International (DDI) to offer leadership development training. DDI is a human resource firm widely recognized for leadership and management training programs that improve employee performance. The company received the top ranking as the number one leadership development provider by Kennedy Consulting Research and Advisory’s The Kennedy Vanguard Matrix. The Kern Center will be offering trainings three times a year. Modules will cover topics, such as, Communication for Leadership Success, Coaching for Peak Performance, Driving Change, Resolving Workplace Conflict, and Building and Sustaining Trust. The next DDI training series begins February 28. To register or receive more information about future DDI offerings through the Kern Center, contact Peter Palko, Workforce Development Account Executive, at 419.559.2325 or ppalko01@terra.edu. Interested persons can also visit http://www.terra.edu/ContinuingEducation.html. Terra State Community College’s Kern Center for Workforce Development and Corporate Partnerships designs and delivers training programs and courses, certification and testing, and apprenticeship programs for individuals and organizations. The Kern Center prides itself on offering high quality training and flexible delivery options that can help you or your organization meet and exceed your goals. The staff at the Kern Center looks forward to working with you! Since 1970, DDI has helped thousands of organizations achieve superior business performance through selecting, developing and retaining extraordinary people. Helping companies find and hire better people faster. Building leadership capacity and capability, enabling organizations to meet their current and emerging business needs. DDI’s innovative solutions, including Web-based technologies, are customized to the needs of each client by a team of 1,000 experienced associates in 70 locations around the world. For more information about DDI, visit www.ddiworld.com. The Ohio State University Extension in Seneca County aims to connect the university’s resources and knowledge to the community. Originally working closely with farmers to share research on growing better crops and livestock, the OSU Extension now works with many different parts of the community. It separates these parts into four compact areas of outreach; Agriculture and Natural Resources, 4-H Youth Development, Family and Consumer Services, and Community Development. Agriculture and Natural Resources programs assist with technology, marketing and educational support, and even offer training opportunities and certifications. 4-H Youth Development teaches kids lessons in leadership, communication and collaboration while increasing their knowledge in math, science, technology and a variety of other topics. Kids are able to participate in a number of ways, including community clubs, camps, in-school and after-school activities, and summer programs that both increase their self-confidence and personal skills in addition to honing their skills in specific subjects such as animals, computers, public speaking, or cooking. Family and Consumer Services provides community members with the skills, knowledge and resources to make informed, healthy life choices. This is done through teaching and promoting safe food practices, better nutrition, better finances and better relationships using evidence-based, impartial, current research into useful information that can improve the quality of people’s lives. Community Development advances income and employment opportunities by applying cutting-edge research, knowledge and innovations to improve local businesses and the communities they serve. By examining the needs of each community, the OSU Extension is able to enhance the wellbeing of communities and neighborhoods through interactive and collaborative partnerships with local businesses and organizations, community leaders and local officials. Since 1914, the Ohio State University Extension has been helping Ohioans build better lives, better businesses, and better communities. To learn more about the OSU Extension visit their website, and check out some of the additional programs they offer like the Master Gardener Volunteers and SNAP-Ed, a free nutrition education and obesity prevention program serving low-income adults and youth. Terra State Community College President Dr. Jerome Webster announces new Workforce Demand Scholarship. October 2, 2017 (Fremont, OH) – According to the Georgetown Center on Education and the Workforce, 64 percent of Ohio jobs in 2020 will require postsecondary degrees or credentials. However, approximately 45% of Ohio high school graduates do not attend college directly after high school. That is why it is imperative that this year’s high school seniors give serious thought about continuing their education beyond high school. To assist those in their decision, Terra State Community College is offering 2018 graduates the opportunity to attend class tuition-free if they are pursuing a career in a high-demand job field through the Workforce Demand Scholarship program. In addition to an education, students will also gain a guaranteed work-based experience. To qualify, a student must be enrolled full-time (twelve or more credit hours) for the fall and spring semesters and part-time (six or more credit hours) for the summer semester. Students who are awarded the Workforce Demand Scholarship will be provided the opportunity to participate in a work-based experience with an employer in Terra State’s service area. “A recipient of the Workforce Demand Scholarship will need to enroll full-time at Terra State and attend consecutive fall and spring terms,” Martin points out. “Students will have to maintain a 2.0 cumulative grade point average and have a course completion rate of 68%. Students also have the option of enrolling in summer school.” Recipients will lose all benefits if they stop taking classes and resume at a later date. Terra State Community College continues its dynamic transformation as it works toward the goal of becoming the best rural community college in the nation. Offering the Workforce Demand Scholarship is an additional avenue to support the college’s goals. For more information on the Workforce Demand Scholarship, interested persons can call 419.559.2349 or email admissions@terra.edu. Terra State Community College is a two-year accredited, state-supported, commuter college located in Fremont, Ohio. Terra State has a long history of service to the community and providing students with an education that is both accessible and affordable. Terra State offers twenty-two Applied Degrees and Certificates to students. Thinking about starting a business? Or wondering how to expand the small business you have already? 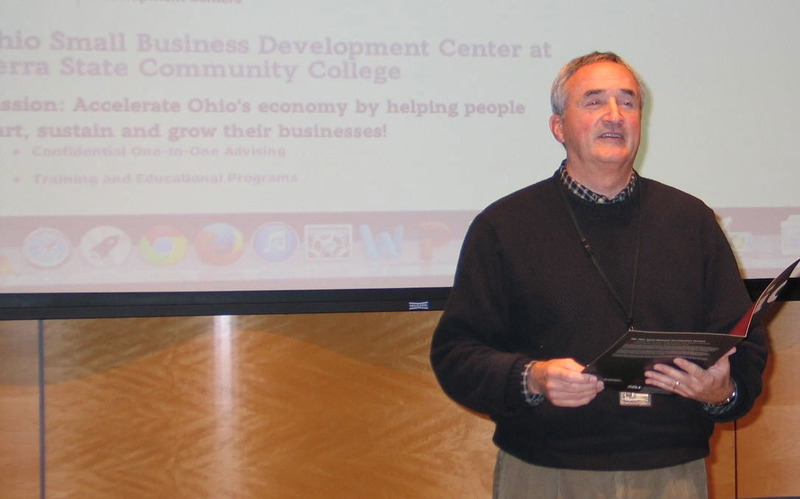 The Ohio Small Business Development Center at Terra State Community College is offering free, two-hour seminars every month on how to start, buy, or expand a small business. Topics covered include the basics of name registration, licensing, taxes, advisors, business entities, employees, insurance, financing, business planning and more. Bill Auxter, a small business owner himself (Auxter Printing Services) and Director of the Ohio Small Business Development Center for the area (located in Fremont), will be leading the sessions. More information and a complete list of times and locations can be found here. To register, contact Bill Auxter at 419.559.2210 or bauxter@terra.edu.